A few years ago, an omnipotently powered Nick Fury spoke a single sentence to Thor. It was something so profoundly soul-stirring that his ability to wield Mjolnir was wrenched from him, and he became nothing more than the Odinson rather than the God of Thunder. Now we finally know what those words were. The Unworthy Thor series has been following the Odinson in the pursuit of a new hammer to claim for himself now that Jane Foster has become worthy of Mjolnir, specifically the hammer of the fallen Thor of the Ultimate Marvel universe, after he perished in the events of Secret Wars. 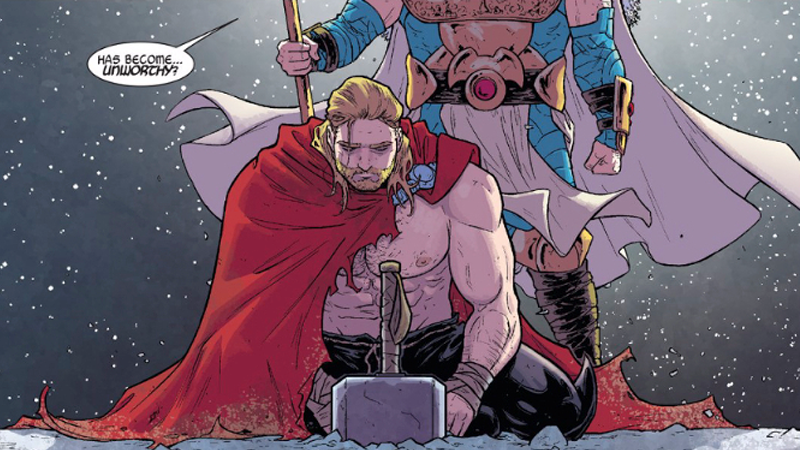 Except today’s Unworthy Thor #5—by Jason Aaron, Olivier Coipel, Kim Jacinto, Pascal Alixe, Mat Lopes, and Jay David Ramos—reveals that in the end, when faced with the chance to claim the Ultimate Mjolnir for himself, the Odinson will not carry it. This time, it isn’t a question of unworthiness. Odinson realizes that, despite his yearning for the purpose a weapon like Mjolnir gives him, the Ultimate Mjolnir is not his to wield. He wasn’t chasing a new destiny, but someone else’s—and he’s enough of a hero to know that, defending the hammer from both the greedy grasp of the Collector and Thanos’ minions, casting them all out of Old Asgard once and for all. So why does Odinson suddenly decide to decline the lure of the Ultimate Mjolnir? It goes all the way back to the moment in Original Sin, when Nick Fury—blessed with the powers of the Watcher—spoke to him. And it turns out that they’re words that echo from Aaron’s run on Thor, God of Thunder. The Odinson doesn’t just believe that he is unworthy, he believes all the gods of Asgard are. Because, it turns out, the words Fury told Thor all those years ago were “Gorr was right.” The God Butcher, who plagued Odinson in God of Thunder, launched his assault on the gods in the rigid belief that their time was over—that the Gods had forgotten the mortals below them and grown lax in their service to the wider cosmos. Odinson opposed Gorr, but it’s clear the encounter has had far reaching ramifications on his outlook—because now he agrees with the God Butcher that no god is worth the adoration they’ve received for millennia. This, however, doesn’t make the Odinson any less of a hero—if anything, his decision to no longer seek that godliness and yet still be the man he is makes him even more of one. It’s a new chapter in his life, a separation of Thor the God and Thor the Man. Just as Mjolnir sought new worth in the hands of a human woman rather than another Asgardian, it’s a clear progression that the age of Asgard’s prominence in the nine realms is nearing its twilight. So where does this leave the Odinson? Well, now he’s at peace with himself, willing to defend Old Asgard as he sees fit, hammer be damned. But it also means that the Ultimate Mjolnir goes unclaimed in the Marvel universe... well, at least until the very last pages of Unworthy Thor. Yesterday’s June solicits for Marvel already spoiled that a new Ultimate Thor was on the way, but now we know he has a new title. It’s all a little bit Doctor Who’s 50th anniversary—someone who does what they do without choice, someone willing to do things no other Thor could: a War Thor. Rhyming aside, it’s a pretty ominous sign of what’s to come to Asgard and beyond. Now we’ll just have to wait and see who this latest Thunder God really is.